description: Cut from a thick steel sheet, a much enlarged object referring to the so-called popular in the '30 of the last century stucco work - German souvenirs that often decorate bourgeois houses. The stucco pattern is original, significantly enlarged, cut out with a thick sheet metal laser (the object weighs 90 kg) painted black. This souvenir refers to important moments of German history. 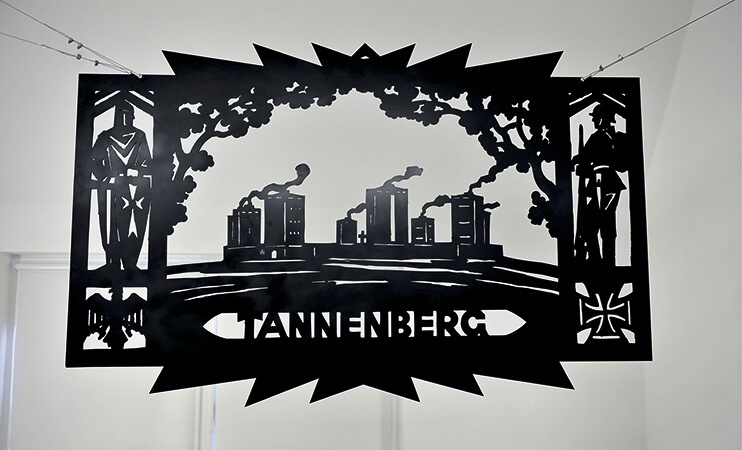 It is a reminder of one of the most spectacular German victories - the Battle of Tannenberg, the memory of the Teutonic heritage and the centrally presented Tannenberg monument from 1934 - the death of Paul von Hindenburg (as evidenced by smoke from torches burnt at that time located on the towers of the monument).